With increasing noise levels becoming a major issue in open-plan and shared offices, glass-sided pods of all shapes and sizes were a key trend at the fair. 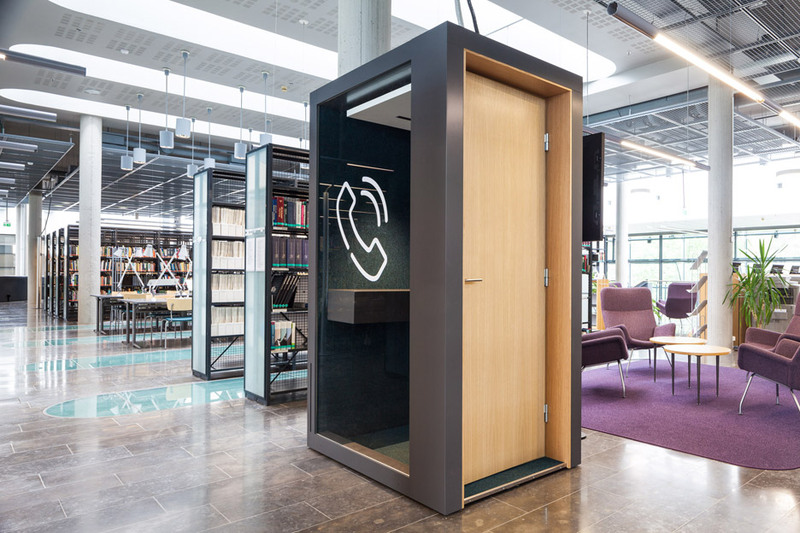 These ranged from one-person pods for phone calls and quiet individual working to modular meeting rooms that can be erected inside existing offices without the need for building work. "The trend for pod rooms is accelerating all the time," said Johanna Kettunen, COO of pod manufacturer Into the Nordic Silence. "The reason is that so many companies have open-plan offices and there are not enough support spaces in those offices, so people are not able to concentrate on their work tasks. They need places to collaborate." Into the Nordic Silence showed a number of products at this year's fair, including a pod for taking telephone calls, called Pod Phone, and acoustically friendly modular furniture. The modular furniture pieces include a curved meeting-area called Point Cup, with high, padded walls upholstered in soft fabric that block surrounding sound, and Cube Solo, a single seat that envelops the worker. "Space needs to be adaptable nowadays because there is a need for frequent layout changes," Kettunen added. "That is the reason the modular pod rooms are needed. You can transform an open-plan office into a healthy and functional activity-based office." Noise-reducing products such as acoustic wall-panels, fabric desk-dividers and hooded chairs have been popular in Scandinavia for several years, since the move to open offices combined with the popularity of wooden floors and plain walls in the region combined to drive workers to distraction. The fair, the largest in Scandinavia, was once again full of brands offering acoustic solutions, including Baux, which launched a biodegradable panel that can be applied to office walls and surfaces. But now the rise of co-working spaces is driving the need for even better solutions that offer privacy as well as silence. Designer Henrik Kjellberg of o4i Design Studio presented PodBooth at the fair, a pod manufactured by Nordic brand Martela, which you can easily roll between locations. "Open-plan offices have a lot of noise, so this is a natural development," Kjellberg told Dezeen. "People need some space where they can go and talk privately but also you need the person that is very loud to work in a pod to make it a pleasant environment for the other people. It's a two-way thing." He added that demand is not just coming from offices but all types of workplace where noise is an issue. "The good thing with a pod is that if you have a car workshop where there is a lot of noise you could place it there," Kjellberg said. "The need for privacy boxes is huge in many places, not only the office." 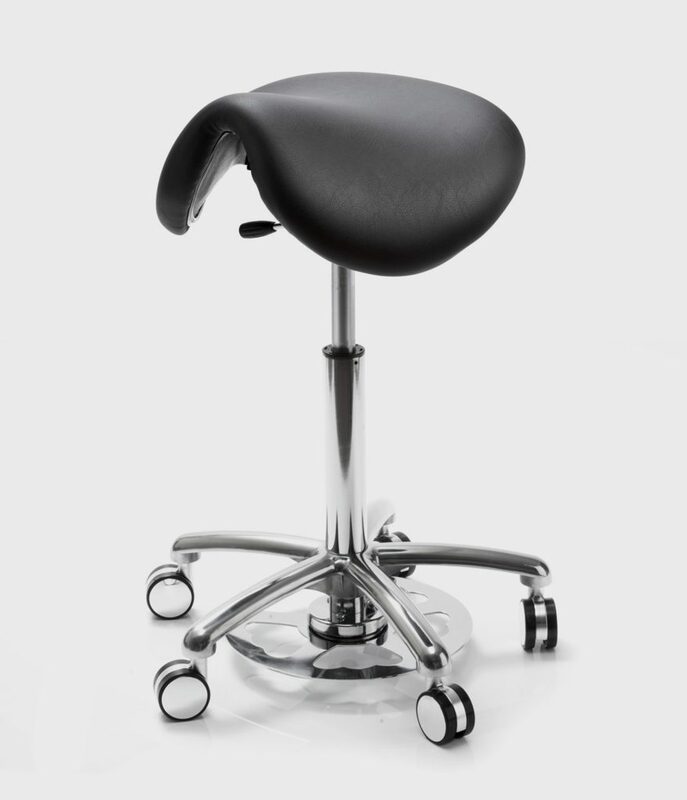 Another item in abundance at the fair was backless, saddle-shaped office stools. A response to growing concern over the negative health effects of a sedentary lifestyle, these products are deliberately unstable to ensure the worker engages their core muscles as they sit. "It’s very important for the body to sit actively; to have movement," said Titti Liljegren of Lanab Officeline, which debuted a number of "active" or "saddle" chairs. These allow you to workout while you work," Liljegren said. "There have been lots of articles saying that we are not supposed to sit down," she added. "We are supposed to stand up, like with the standing desks. And now there are also articles that say that we are not supposed to stand up all day. So the active chairs, or saddle chairs, are a good meeting point between standing and sitting." Other products in plentiful supply at the fair included adjustable desks, which allow workers to alternate between sitting and standing, and balance boards. Balance boards consist of a platform that rocks from side to side, or around an axis, meaning the worker standing on it has to engage their muscles to remain stable. Norwegian brand Backapp unveiled a product that combines a saddle chair with a balance board to give employees the best of both. The product claims to improve posture and reduce pain for people with back problems. “You can actually sit on this balance board," said Backapp CEO Freddy Johnsen. Par Gustavsson of office supplies retailer AJ Produkter said the trend towards healthier furniture was being driven by workers. "People are caring about their own health and activities," he said. "We sell a lot of adjustable tables and chairs that are ergonomic. We also have balance boards, which are trendy. It's not something you can use eight hours a day but you can use it for two hours and then stand." Gustavsson added that companies were increasingly introducing "active days" where people get out of their regular task chairs and use saddle chairs, wobble boards and standing desks. "There's a lot of talk about having an active day at the office," he said. "The best is to have some variation during the day where you stand up or use active seating products, but use an office chair if you want a rest." "Wellbeing is becoming increasingly relevant in all aspects of the workplace whatever kind of job you do," said Stacey Turner, digital content manager at Norwegian workplace furniture Flokk. Office workers and designers are increasingly "seeking alternative, unconventional features," she said, adding that height-adjustable desks and the sit-stand trends were both "rising in popularity". Flokk pre-empted the active seating trend with its 1986 HÅG Capisco seat by Norwegian designer Peter Opsvik, who also designed the Tripp Trapp highchair for Stokke. 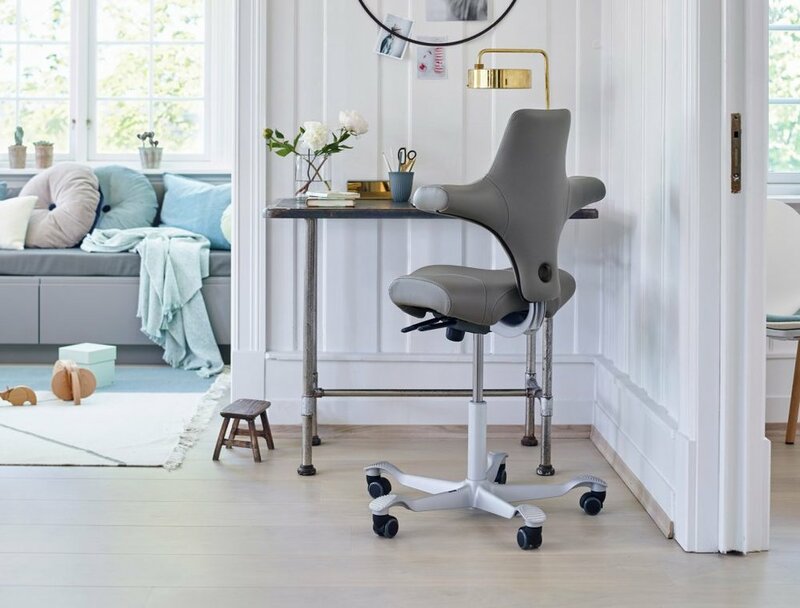 Featuring a saddle-shaped seat and a minimal back, the HÅG Capisco encourages movement throughout the day. "It's easily our bestselling chair and its popularity is still rising," she said.